London - He may be going home a gold medal short, but Oscar Pistorius still ruled at the 2012 London Paralympics Games. "I was away on holiday abroad looking at the papers and it was all about Oscar Pistorius," said Roger Black, Britain’s former Olympic and world 400m silver medallist. "He is one of the most recognisable sporting figures in the world. "He does probably more for the Paralympic movement than anybody else because of the coverage he gets." Despite the success of Team Great Britain, who finished third on the table, behind China and Russia, with their 34 gold medals, it was Pistorius who dominated the pages and the television screens. He signed off in emphatic style on Saturday night when he stormed to victory a full 3.5 seconds ahead of his nearest rival in the men’s T44 400m final. Pistorius looked up to the heavens with his arms open wide as he crossed the line in a Paralympic record 46.68 seconds, while the other athletes were still halfway down the home straight. "It was the last race of the Games and that was the last word," said Sebastian Coe, chairman of the London Organising Committee for the Olympic Games (LOCOG), afterwards. "Every neutral in the stadium wanted that." 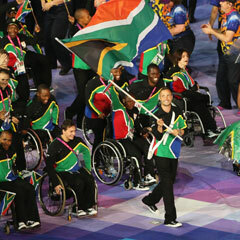 From a South African perspective, Pistorius afforded his country the honour of having the national anthem Nkosi Sikelel’ iAfrika bring down the curtain to the summer games with his 400m gold medal victory ceremony being the final event. Having lost his 100m title to Briton Jonnie Peacock and the 200m race to Brazilian Alan Oliveira, Pistorius went into the last event with only the 4x100m relay gold as the only top prize to show for his efforts. He was never in danger though as Blake Leeper of the US, clocked 50.14 and fellow American David Prince took bronze in 50.61. "Oscar makes me want to run harder and strive harder," said Leeper looking at the 400m silver in his hand. "He’s my hero and to be able to run a race with him and to take silver behind him, means a lot to me. "I only want to get better and hope that one day, when I step onto the track, the crowd yells and roars like that for me. "Seeing what Oscar has done just inspires me and, hopefully, four or eight years from now, I can be on the same level - he’s just an amazing athlete." As he capped a remarkable final night at the Olympic Stadium, Pistorius summed up his own feelings. "This summer has been a dream come true and I couldn’t have hoped for anything better," Pistorius said. "These have been some of the biggest highlights of my life. "It was very special to me as it was the last event of my season and the last event of London 2012. "I just wanted to give the crowd something they would appreciate and take home with them. "Lord Seb Coe and his team at LOCOG have done the most amazing job at the Olympic and Paralympic Games."